The Northern Lights are a spectacle. 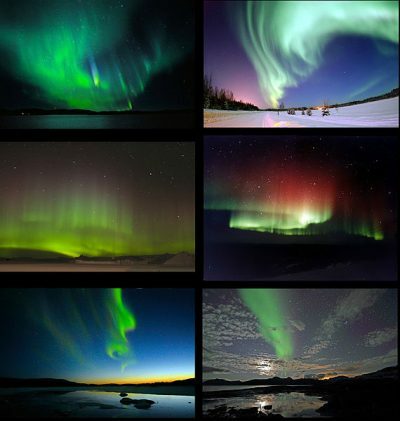 Knowing the mythology and science of auroras enhances the poetic quality of nature's light show. Understanding something so grand does little to diminish one's awe. The Algonquins of North America believed Nanabozho, after creating earth, went to the far north to build great fires reflecting southward as an expression of lasting love. The Finnish word for the northern lights translates to Fox Fires originating from a Finnish fable. In the fable, the lights were caused by a fox sweeping his tail across the snow spraying it into the sky. The Saami, indigenous arctic people, believed the lights to be blazing fires from the souls of the departed and to disrespect the fires would lead to bad fortune. There wasn't a scientific rationalization of the Northern Lights until French geophysicist Jean-Jacques d'Ortous de Mairan linked auroras to solar activity in 1774. An aurora is a display of light in the sky prevalent in the high latitudes. The light emanates from the collision of energetic charged particles with atoms in the high altitude atmosphere. The charged particles originate in the magnetosphere and from solar wind. The Earth's magnetic field draws the particles into the atmosphere. During a geomagnetic storm, the visible auroral zone expands into lower latitudes. NASA Crew Earth Observations uploaded the following video sequence of an aurora over the Great Lakes and Canada. The video was made by the crew of Expedition 30 on board the International Space Station. The video sequence was made on January 25, 2012 from 09:27:08 to 09:32:16 GMT, as the Space Station passed from northwestern Wisconsin to southeastern Quebec, near the Gulf of St. Lawrence.